Previous post: Years later they meet again and fall in love and the world falls apart. Next post: I love markets. 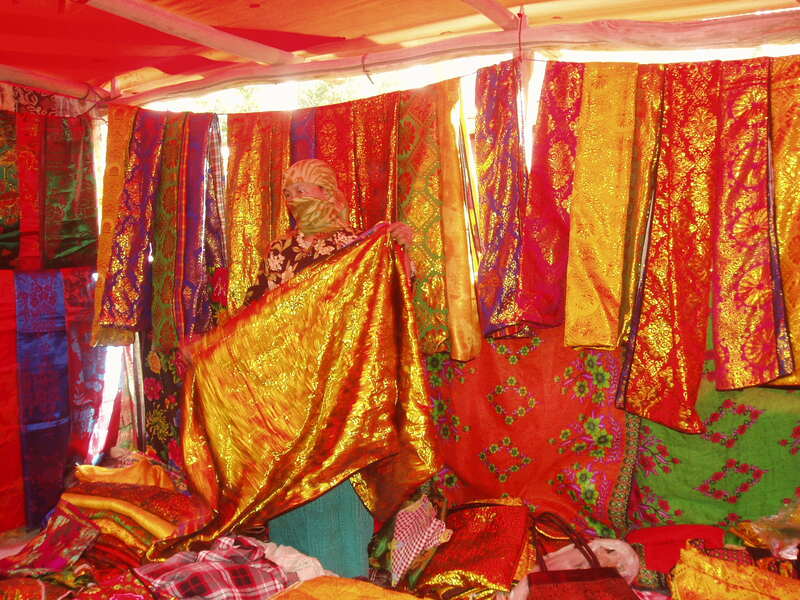 Allow me to introduce you to a silk merchant in the market at Kuche. Yes, those materials were just as blinding to the eye as they are to the camera lens. As she was displaying her wares to us, the muzzein sounded the call to prayer. She held up a hand, laid aside her silks, got out her prayer rug, and knelt facing east to do her prayers. After which, she rose back to her feet, folded her rug and put it away, and resumed business. I bought a long length of rainbow-colored net gauze to give to my niece the seamstress. I could have bought a lot more. The words lustrous, luscious, vibrant, rich come to mind. I have an exquisite brilliant scarlet silk shawl/scarf that is completely embroidered with gold thread that my mom got while we lived in Turkey in the mid-1950’s. It resides in a cedar chest, rolled around a tube and protected in muslin. It is supple and shimmers as it did back then. It could be hanging with those in this picture. So beautiful. I have a beautiful gold silk scarf with different colored silks melded into it. It was given to my husband and I from a Chinese delegation that came to our Search and Rescue Base a few yrs ago. They came for some training ideas. That picture is gorgeous Dana, so many bright and happy colors.